Thanks to funding from Environment Wales and GE (Aviation) Volunteers, we have been working to provide Cardiff’s bats with new homes in Bute Park and Hailey Park. These are in the form of three different types of bat box, and are attached to trees around the parks. These parks are part of Cardiff’s network of rivers and green spaces, all of which are vital to ensure wildlife, such as bats, can survive in the urban environment. Whilst there are plenty of insects for our bats to eat, natural roost spaces in urban parks are harder to find as trees with holes or crevices are more likely to be removed for public safety reasons. By putting up a range of artificial roost boxes, we hope that more bats will be encouraged to use the parks and green spaces of Cardiff. 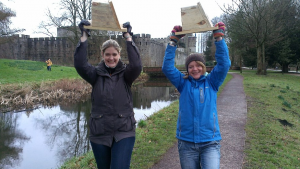 Over 100 boxes were put up in Bute Park in early 2013. Sadly quite a few were vandalised or removed. However, we can happily report that on our first check in September 2013, we found 12 pipistrelles roosting within some of them! 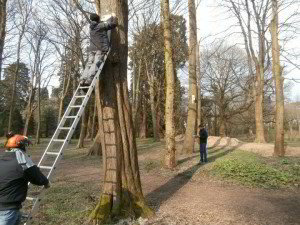 Other parks such as Parc Cefn Onn will be installing their own bat boxes and we will monitor those in due course.